A recent men’s magazine broke down by decades suggested exercise guidelines for people as they age. I wish I had kept the issue for reference as I write this, but I didn’t. I can say that it was not one of the steroid-bodybuilder type publications but a men’s magazine of good reputation and reasonableness. My only quarrel, if you could call it that, is more emphasis might have been put on the word “guidelines.” By that I mean workouts should evolve and change from decade to decade, but rigid formats aren't best in every instance. The magazine had broken it down to exact exercises, sets and reps to do in each decade, beginning in your 20s, then your 30s, 40s, 50s, 60s. The 70s on up weren’t mentioned. As mechanical as their guidelines may sound, I shouldn't be too critical, as long as the advice is not taken as absolute. For seniors (those I categorize as adults over 50), it is important to recognize that adjustments to training should be made as we grow older. It is foolish to think otherwise. But everyone’s abilities, capacity and needs do not follow the exact same trajectory as we move from one decade to the next. Also, other factors besides age, such injuries or illnesses, must be taken into account when formulating new programs. In my own case, I saw little difference in what I could do in my 50s, as compared to my 40s. 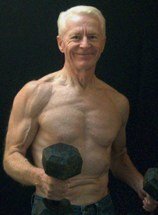 Capacity changes during my 60s also were quite gradual; still, looking back at my training records, I can see there was some loss in strength as well as a need for more recovery time. Then after turning 70, I began noticing a steeper decline in what I was able to do, and I’ve adjusted to it. The need for adjustments may come at different stages for every senior, but at some point training adjustments should be made. I have never believed in marathon workouts. Spending more than an hour in the gym does not make sense to me. But abbreviated workouts become even more important as we age. All-out one rep maximum lifts should be discarded, too, at some point. Seniors sending their blood pressure to the ceiling with gut-busting efforts is not smart. When the great bodybuilder Steve Reeves moved into his 60s and 70s, he still weight trained three days per week, but cut back his sets to two and used lighter weights and 15 to 25 reps, depending on which body part he was working. That isn’t a bad model to follow. Never stop the exercise habit. But adjusting the content and/or intensity and duration is inevitable. Having intelligent guidelines to consider is smart. But remember they are just that: guidelines. Make use of them, but also take into account that we don’t all fit neatly in the same box. On that subject, some pretty good workout guidelines are found throughout Senior Exercise Central. Check them out. And no matter what training decade you may be in, keep up the good work. P.S. If you are a senior beginner, a good, solid place to start is here.